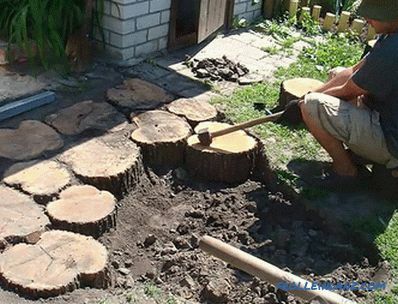 In order to decorate the garden plot in an original way, you can independently make paths from tree cuts. The manufacture of such tracks will significantly change the appearance of the site, and in view of the fact that the material itself can be purchased for little money or not at all, considerable savings are possible. 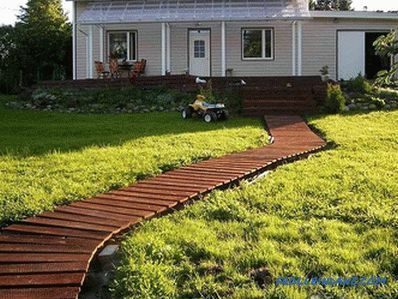 This article will talk about how to make garden paths out of wood with your own hands. First of all, you need to think about the purpose for which you will need a path, for example, for walking or gardening beds. 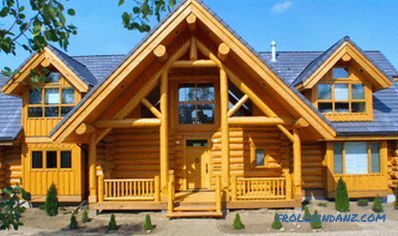 If there is a desire to create an eco style at the dacha, then the use of this natural material would be an ideal option. 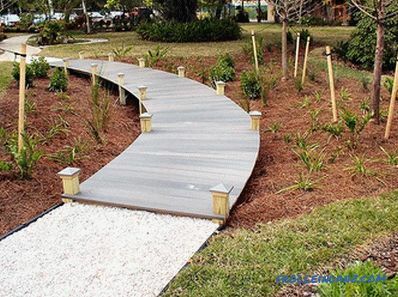 This article will help to see the advantages and disadvantages of this design option garden. 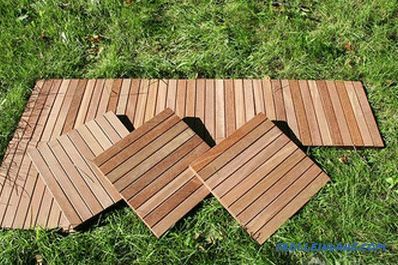 We will also consider the instruction explaining how step by step you can pave paths from wood cuts. material and tools can be found right at the cottage. fire hazard with prolonged exposure to open flame. In fact, there are fewer disadvantages than advantages, and therefore you can safely get down to business. The cuts can be of two shapes: semicircular and round, 0.3–1 m in size, about 10 cm in height. 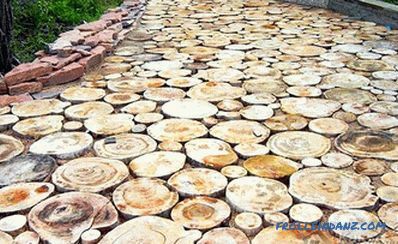 There are several ways to pave wooden walkways. The shape of the track can be arbitrary - in this version it will look much more beautiful and attractive. In addition to the tracks, you can build a decorative ladder or bridge from the cuts. First you need to prepare the tools for work. 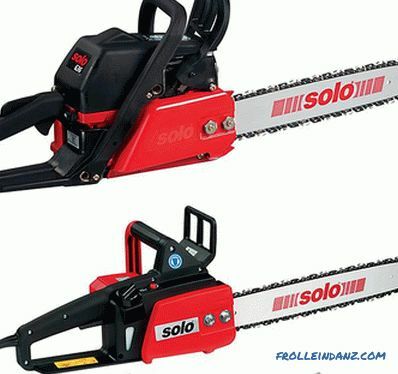 In this case, you will need a chainsaw (or electric saw). 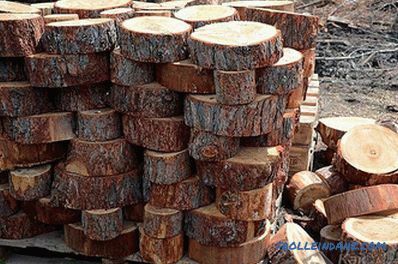 Logs for cuts in advance must be well dried, otherwise (if laid in the raw state) they can crack and deform. If the material dries when buried in the ground, the view of such a track will be unattractive and will have to be redone. 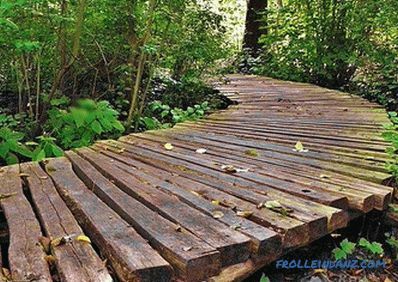 On how carefully the material is treated with an antiseptic, the service life of the structure depends, be it garden paths, bridges or ladders. Typically, processing is done with linseed oil, a solution of copper sulfate or used machine oil. After processing, the material should dry well. Then it is necessary to treat the product with a layer of waterproofing from melted bitumen. Bitumen should be applied to the lowest part of the cut, which will be immersed in the ground. 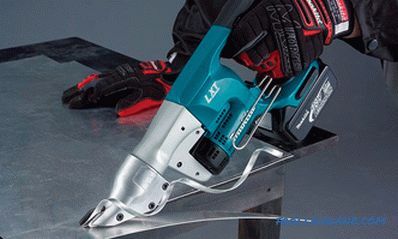 There is another option for waterproofing - immerse the bottom of the saw cut into a container with molten bitumen and gasoline added to it. 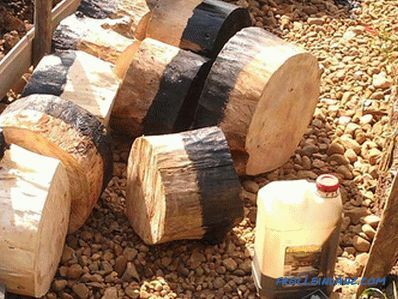 After this procedure, you need to give the wooden products to dry well. 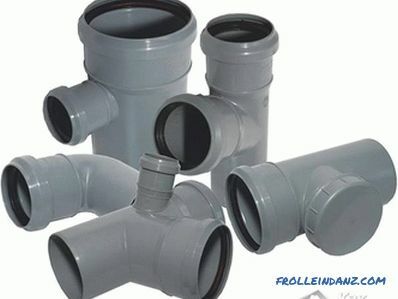 In the markets, ready-made impregnation is sold that contains protective substances - this method will be more reliable. 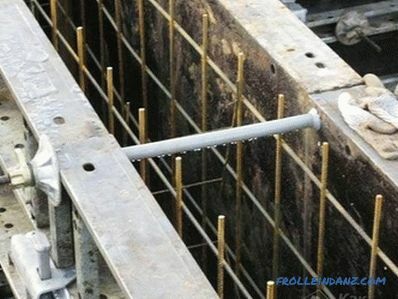 In order to lay the cuts beautifully, it is necessary to mark the territory with pegs, which need to be hammered along the entire perimeter of the future path , then the cord is taken and pulled between the pegs. 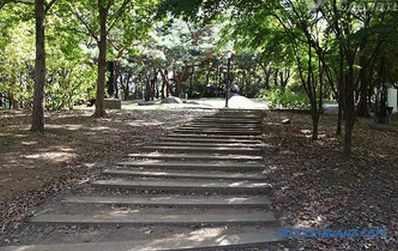 When the path is winding, the marking is performed using sand. After preparing the markings, a trench of about 30 cm in depth is dug out, in which a drainage system is built, designed to protect the cuts from moisture. To do this, rubble is laid on the bottom of the trench and rammed. From above you need to put geotextiles and make sanding. Each of the layers is poured with water and tamped with quality. 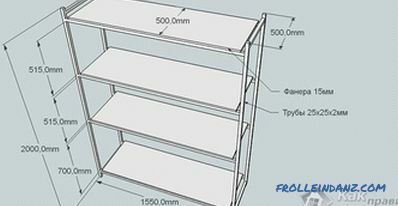 The thickness of the resulting layer should not exceed 10 cm. Now You can begin to lay the cuts, placing them closer to each other and selecting the diameter of the workpieces. 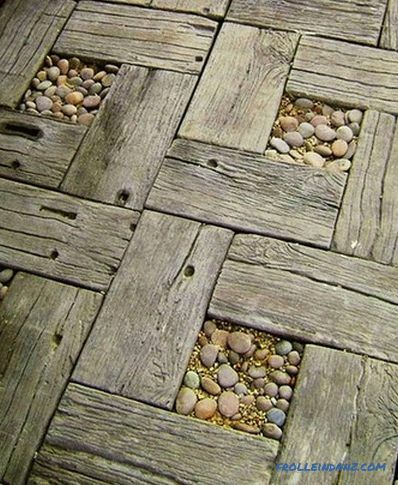 To fill the joints between the saws, use crushed stone, sand or pebbles. Often, for beauty, the space between the paths is sown with lawn grass. 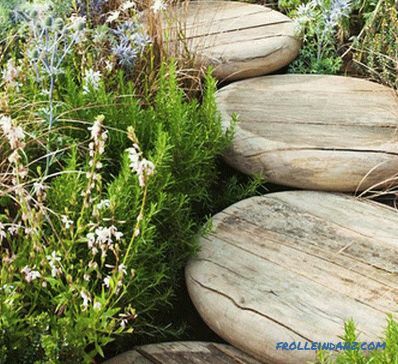 Along the edges of the walkway, you can decorate using higher cuts, decorative stones, or high-quality filling with primer. 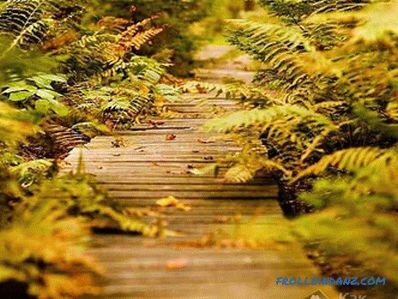 Flowers will surely be a beautiful decoration of the garden path. Irregularities on the garden The plot can be hidden by means of a garden path, made in the form of steps, especially if there is a slope on the plot. 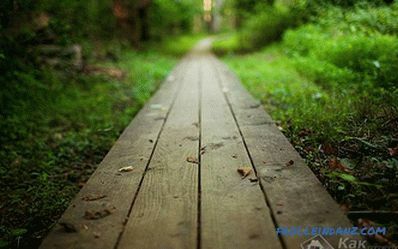 It should be remembered that the garden path must be primed annually to protect the tree from rotting, which will increase the life of the path. 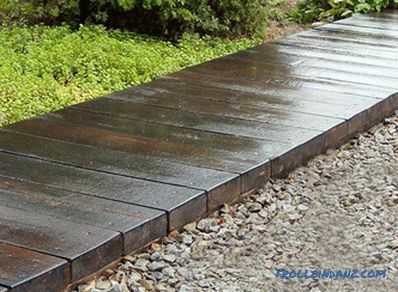 As an option , as a material for garden paths, you can use wooden planks. Most often, this track has the appearance of solid flooring. Plates are stacked both in the transverse and in the longitudinal direction. To the path was winding, the edges of the plates are specially trimmed or stacked in a special way. Using this approach, you can simulate various options, for example, a pattern, similar to parquet. And if the boards are placed at some distance from each other and the space between them fill with gravel or gravel, then the structure will resemble a railway. 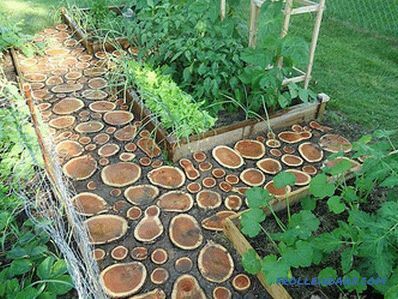 You can make a garden path from planks laid out with solid flooring. This path is made slightly raised by about 10 cm. 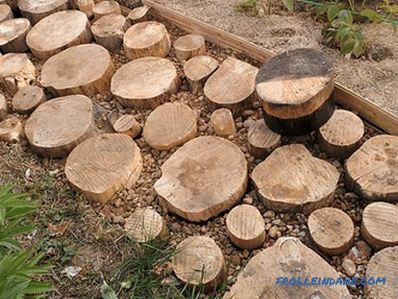 This has a great advantage - there is no contact of the tree with the soil, and the airspace allows the tree to dry quickly after rain, which significantly contributes to the long use of the garden path. 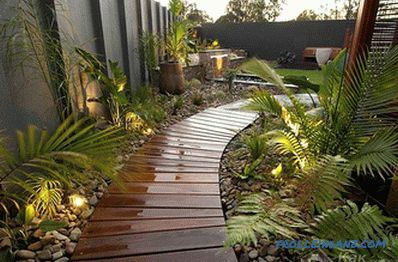 To create your own garden path from the elements of the tree, you need to spend a lot of time and effort, but you can get a real masterpiece. 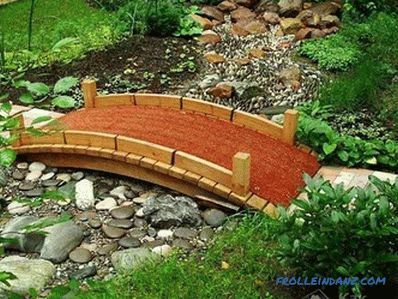 Such a path will be a beautiful and extraordinary addition to the garden decoration.